“Harbinger of spring” is a common name given given to a spring ephemeral wildflower, which among other places throughout the Eastern United States, can be found in bloom as early as February in our Ozark woodlands and forests. 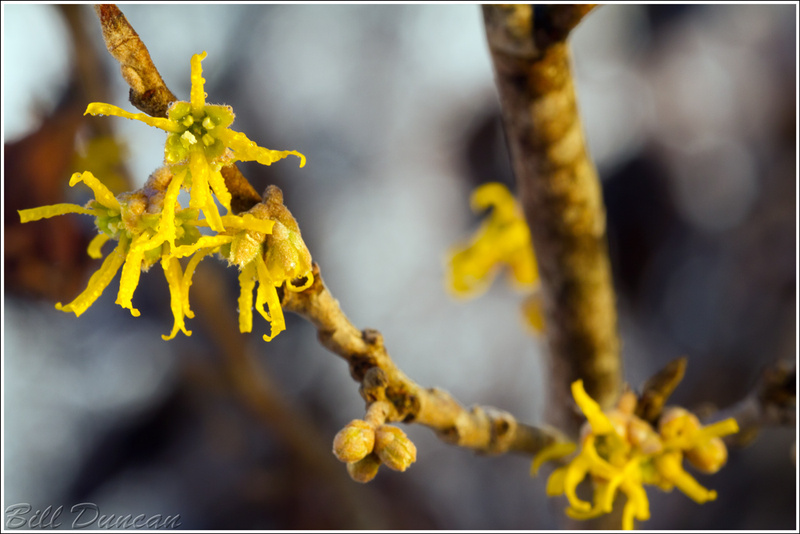 Ozark witch hazel, pictured below, is a species of shrub found in the St. Francois Mountains that begins to bloom in early January. 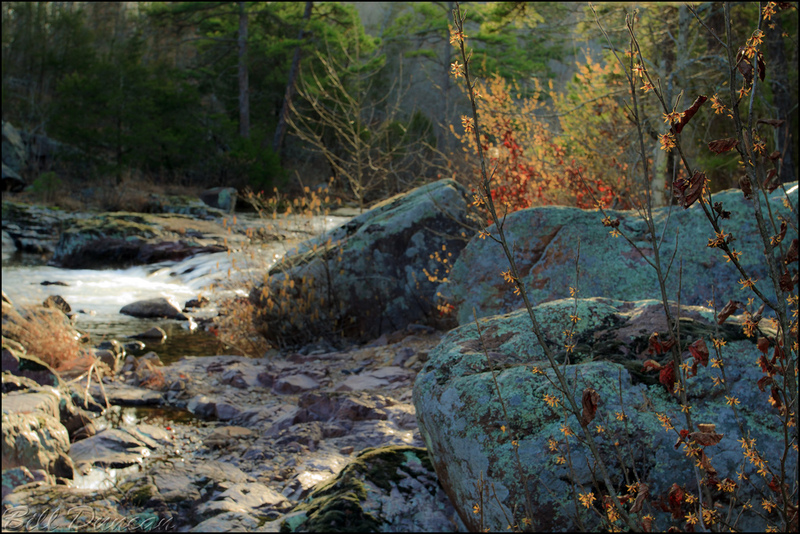 These images were taken on January 7th at Lower Rock Creek Wilderness in Madison County, MO. These plants are incredible and I seek out their blooms every year during their January though April flowering period. 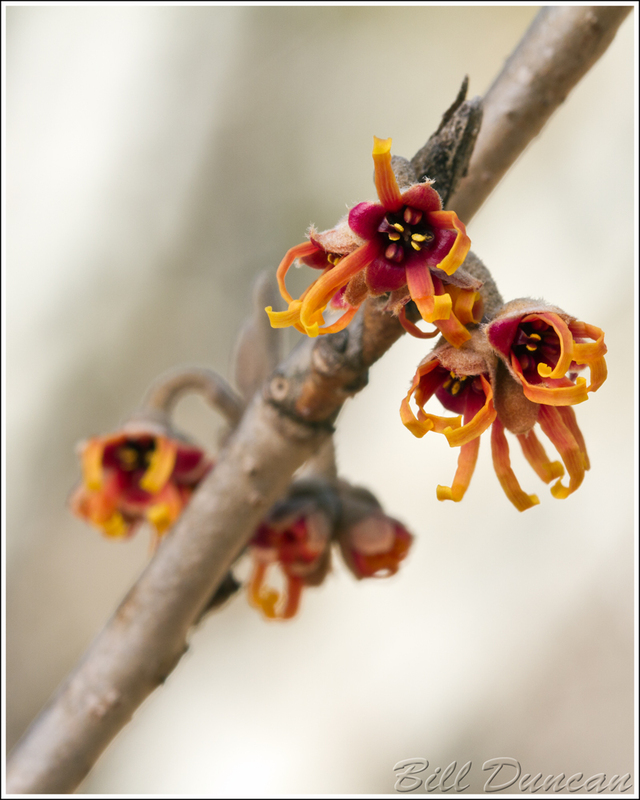 These blooms can last in the middle of the harshest winter for up to six weeks under temperatures as low as 0 deg F. When temperatures get much below freezing the long petals will curl up and then uncurl during sunny warm weather. When warm these blooms emit a very pleasant, vanilla-like scent. I spent a good amount of time yesterday napping in the sun on a rhyolite shelf of Lower Rock Creek listening to the rushing water and having the scent of these fresh blooms waft by me with a gentle cool breeze. These plants are also noteworthy for the variability in color of their flowers. I’ve found plants side by side that held flowers completely of red, oranges and reds, or like the plant below, nothing but yellow. Typically the sepals of these plants will be a lovely burnt, orange/red and the strap-like petals will be lighter shades of orange and yellow. It has been suggested by some that these colors may change over the course of the individual flower’s life, over the course of a season, or even over the course of the plant’s life. I do not know the answer to this. As you can see below, these yellow flowers are fresh, crisp and new. Every year I wonder about the specific pollinator(s) that service this species. I’ve read that it may be early emerging species of bees or flies. I saw a few insects and other arthropods moving about around the water, but never witnessed a visit to the flowers while I was shooting them yesterday. Flies can be very ephemeral and advantageous about when they will emerge over the course of a season. It would not surprise me that flies fill this role, at least until March or April when more insects are up and about looking for their duty. My visit to this special place exemplifies that to study biology-to study nature is to study exceptions. I’m not sure if I’ve ever heard a “rule” or “absolute” by expert or professional in the realm of biology that turned out to be truly universal. If there is a niche to be filled or an opportunity to thrive, natural selection will see to it, as long as it makes sense for the time and place. Bill, these are great! I’ve always enjoyed your photography, and seeing familiar places through another lens. I’m happy to find this blog, and that you’re still delivering quality shots of Missouri. The best of light to you!